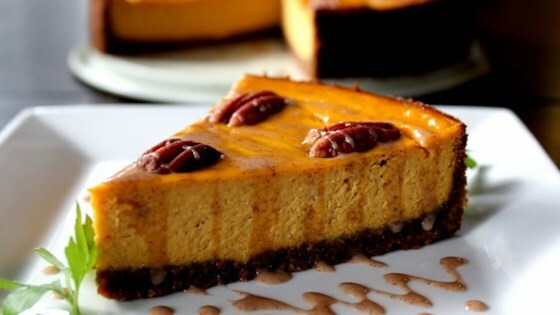 "Pureed carrot mixes with cream cheese in this very elegant cheesecake that also has a gingersnap and graham cracker crust." Preheat oven to 400 degrees F (205 degrees C). In a medium bowl, combine graham cracker crumbs, gingersnap crumbs, 2/3 cup ground nuts, and sugar; toss well. Work in butter until mixture is crumbly. Pat over bottom and up sides of a buttered 9 inch springform pan. Bake the crust for 7 minutes. Turn oven down to 350 degrees F (175 degrees C). I used strained babyfood carrots to cut the prep time. This is a wonderful dessert! It's a rich color, and the flavor is delightful. A welcome change from the more common fruit-topped cheesecakes. I changed this recipe to make mini cheesecakes instead. I don't have a springform pan. It turned out great. My husband, who doesn't like cheesecake, ate 3. Thanks for the great recipe! Although I hate carrots & can pick them out of cole slaw, I just love this recipe!! !